A team from PCA Winchester provided excavation services at Barton Farm, Winchester, ahead of a large housing development. Targeting geophysical survey results in eight strip, map and sample areas totalling 5ha., evidence exists of the site’s use from the early Bronze Age up to the 18th century represented by features cut into the underlying chalk. Romano-British mortuary enclosures were discovered, containing inhumation burials dug into the enclosure ditches and within smaller enclosures, or ‘plots’, and cremation burials. Discrete graves have included coffined burials but also crouch burials of uncertain date. However, one crouch burial outside of the large enclosures, in a pit and surrounded by a segmented circular enclosure is a classic ‘Beaker’ burial, accompanied by a typical Beaker vessel. These mortuary enclosures lie 200m from the Winchester-Cirencester Roman road and some 2km from the Roman town at Winchester. As such, they lie beyond the town’s suburb and may form a ‘rural’ cemetery. Another area of the excavation revealed a stretch of the Roman aqueduct that served venta Belgarum. The aqueduct, very similar to the Dorchester aqueduct, follows the 50m contour north of Winchester, meandering for some 25km; it passed through the Barton Farm site following the base of a dry valley. The archaeologists cut sections through it, revealing a wide ditch with a vertical sided and flat based lower section containing fine silt. The profile and fills were identical to a feature first identified as a ground-based aqueduct back in the 1970s and found on the line of the M3 motorway some two miles from our discovery. In stark contrast, the well-preserved remains of an 18th century militia camp was discovered. The site has long been identified as having been used by the Hessian militia, recruited by the British government from Germany, to provide military strength against a possible French invasion in the Seven Years War (1856-63). The militia appear to have been encamped at Winchester for less than a year. 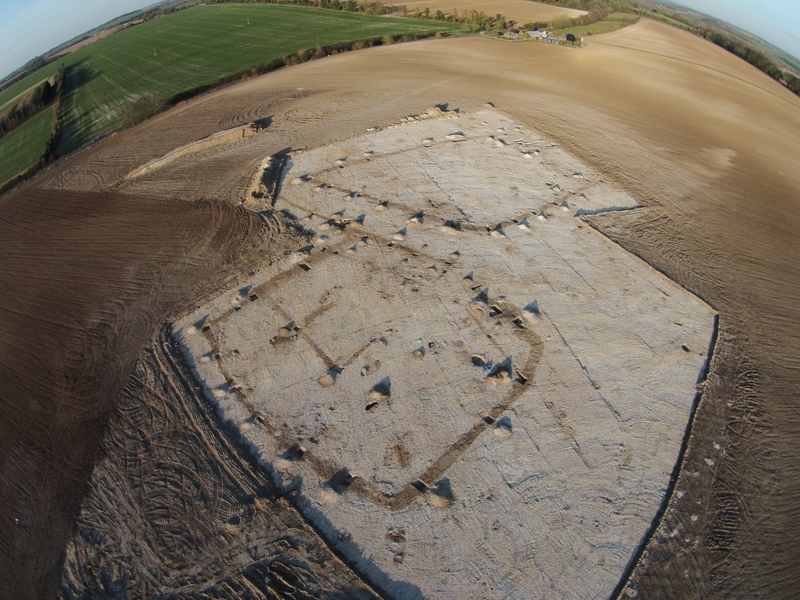 Three field kitchens dug into the chalk were found, corresponding to the results of geophysical survey that appear to show similar features stretching for some 400m across the site. Along with the field kitchens, PCA uncovered latrines, as you might expect, but also large, square pits furnished with steps, ledges and hearths; the Hessian’s it seems were literally ‘dug-in’.